Tulipa kaufmanii has just come into flower in our garden, at the end of March, making a splash of red, white and yellow. It is one of the earlier species to open; and is often known as the 'waterlily' tulip because of the way its petals spread widely open in the sunshine and close at night. Tulipa kaufmanniana is described as one of the easiest species to grow - there is a good article in the Telegraph - follow this link to read it. 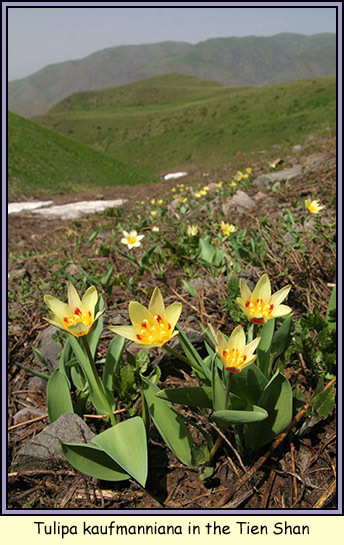 Like many tulips, its natural habitat is in central Asia, centred on Tajikistan and Turkmenistan, and we saw the plant shown above in the Tien Shan Mountains in Kazakhstan, when we were there in 2008 with Greentours. 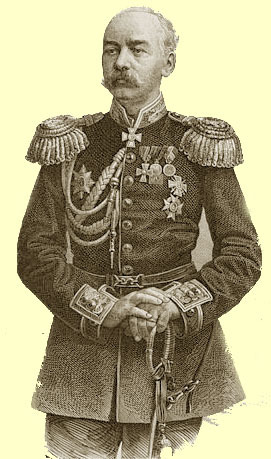 It was first described in 1877, and named after Konstantin Petrovich von Kaufmann, the first Governor-General of Russian Turkestan.